Wormologists please see technical references at the end of this article. In the ChrisDuggleby.com Alpine Press reviews I try to raise the profile of important subjects which you might not have come across in your local press. In particular I have noticed that the established press generally provides limited (if any) space in their major publications to news about alien carnivores. Well we are not going to shirk our responsibility to the public – sometimes people need to know what is going on in the alien carnivore world to fully appreciate serious issues currently facing our global ecosystem. For example, today I came across research published in the respected online PeerJ scientific journal about the discovery in France of an Invasive Alien Species. This research was published by Jean-Lou Justine and colleagues from the Muséum National d’Histoire Naturelle, France (Dept. de Wormologie). 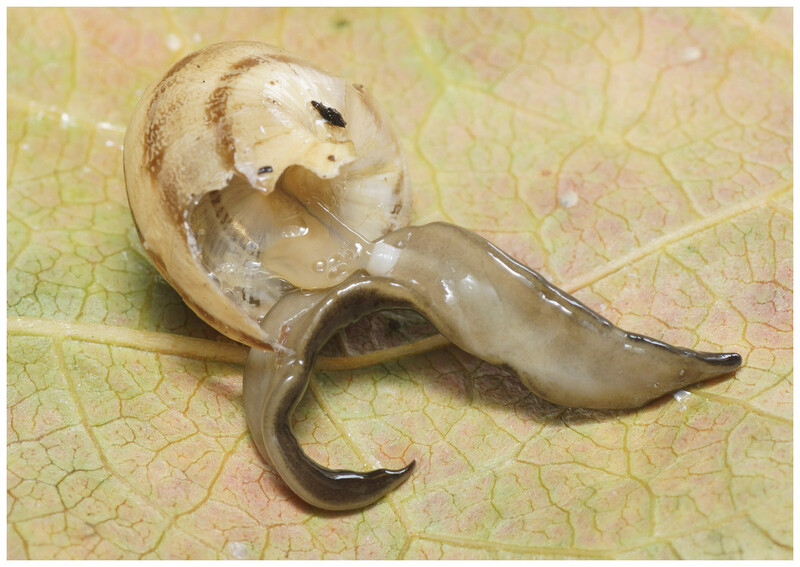 The significance of this discovery in France will be apparent when you realize that one of the main victims of this Invasive Alien predator is the snail. Clearly the whole world of French Cuisine will be in uproar when news gets out that this Alien is likely to decimate the national mollusc population. Here is a photo of the Invasive Alien eating its prey (Parents please consider carefully before allowing your children to see these pictures – especially if they are of a sensitive nature or have pet molluscs). My attention was first drawn to this crisis in an article in the highly regarded German newspaper the Süddeutsche Zeitung. On 5th March 2014 this newspaper reported how the researchers had discovered this Invasive Alien Species living in a greenhouse in Caen in the North of France. 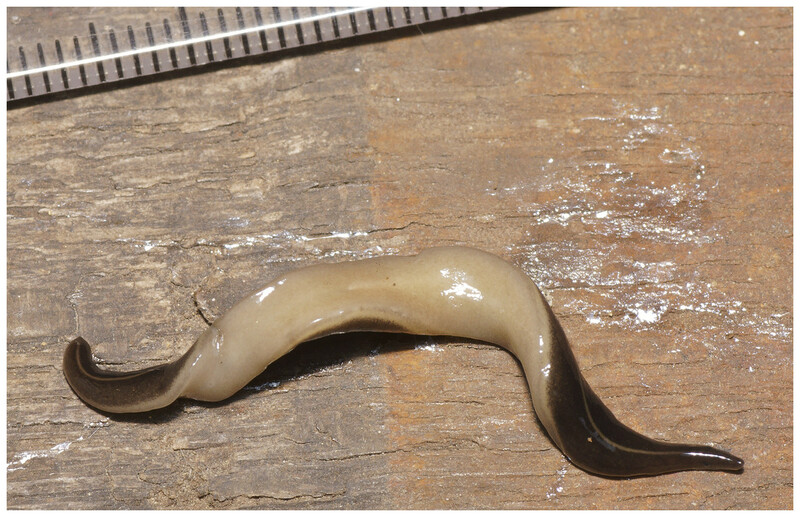 The name given to the species was Platydemus manokwari: it is a Flatworm which is indigenous to New Guinea. This was the first reported sighting of this monster in Europe. The newspaper reported that Scientific experts consider this flat worm to belong to the 100 worst invasive species in the World. Clearly this is an alien invasion threat with major ramifications for our ecosystem. There is a serious concern among the scientific community that this carnivore (yes it is a meat eater!) will now spread throughout Europe. As already mentioned this will be a disaster for snails and other molluscs, but it will also have a serious impact on our indigenous worm population. Our worms are an integral part of our ecosystem and play an important role in the aeration and general well being of our agricultural (as well as domestic) soil. Platydemus manokwari love to eat rain worms and where they have invaded other regions they have devoured huge quantities of the local worm populations. Clearly this is not just an issue for the quality of our soil but also for those many birds who consider worms a part of their daily diet. To attack their victims these flat worms will even climb trees. The French scientists fear a similar devastation to that seen when the New Zealand Flatworm (Artioposthia triangulata) invaded England. This caused the indigenous rain worm population to shrink dramatically. The New Guinea invader has already attacked a number of pacific islands (see the map below). This invasion was made possible in part by flatworms contaminating soil transported with plants and agricultural equipment. However, in some places their invasion was deliberately encouraged by unwitting humans as was the case on the island of Guam. The flatworm was introduced to Guam to bring the local population of giant snails under control but the carnivores did not just stop at eating giant snails. 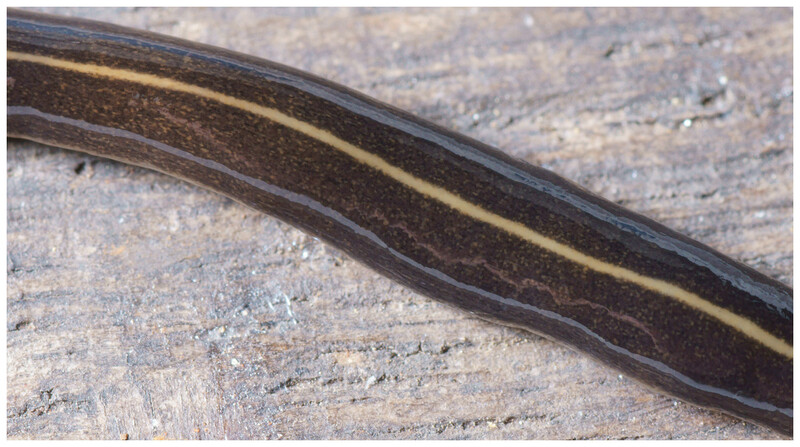 The problem when this Invasive Alien Flatworm enters into a new territory is that the absence of a natural predator means the carnivores can multiply out of control. A possible solution? – Perhaps the promoters of French cuisine might consider encouraging us to try a juicy replacement for the now threatened and much loved molluscs: Garlic Flat Worms? At ChrisDuggleby.com we don’t just identify problems – we try and help to find solutions. 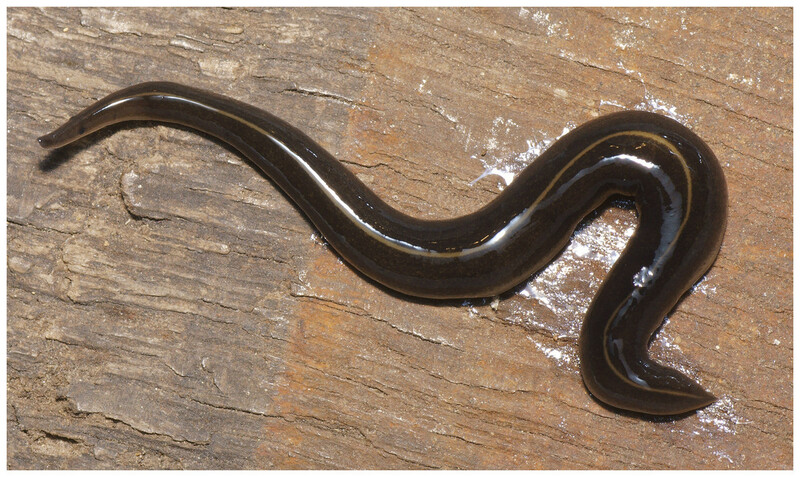 ‘The invasive New Guinea flatworm Platydemus manokwari in France, the first record for Europe: time for action is now’ (by Jean-Lou Justine, Leigh Winsor, Delphine Gey, Pierre Gros and Jessica Thevenot). Published on PeerJ online. For French readers a complete French translation of the text (LE VER PLAT DE NOUVELLE-GUINÉE PLATYDEMUS MANOKWARI EN FRANCE, PREMIÈRE MENTION EN EUROPE: IL FAUT AGIR MAINTENANT) can be found here.